The distillery said its 50-year-old single malt was "flawless"
A single malt Scotch whisky is to go on sale for £10,000 a bottle, its distiller has announced. 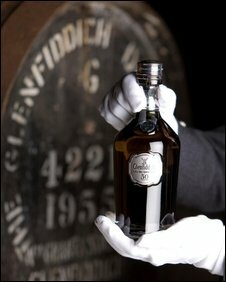 The Glenfiddich Distillery described the 50-year-old single malt as "the pinnacle of our whisky-making excellence". It will release just 50 bottles every year for the next decade. They will be sold in selected airports across the world for the next few months, before being made available through a small number of retailers. The whisky has been kept in two casks in the Banffshire distillery's warehouse for 50 years. Each hand-blown, numbered bottle will be decorated in Scottish silver and presented in a hand-stitched, leather-bound case. The bottles will be accompanied by a leather-bound book which details the history of the whisky. It will also have pages for the owner to make their own tasting notes. Buyers will receive a certificate signed by four of the distillery's long-serving craftsmen. Peter Gordon, chairman of Glenfiddich distillery owner William Grant & Sons, said the whisky was "flawless". Mr Gordon, the great-great-grandson of distillery founder William Grant, said: "We're happy to wait as long as we need to - up to 50 years in this instance - to produce the perfect whisky. "The Glenfiddich 50 Year Old is the pinnacle of our whisky-making excellence and epitomises my great-great grandfather's vision of creating the very 'best dram in the valley'. "Every new year is important when it comes to making exceptional whisky - and Glenfiddich 50 Year Old is the ultimate expression of this pioneering foresight." In 2006 a bottle of whisky believed to be the oldest in existence was auctioned in London. The Glenavon Special Liqueur Whisky is said to have been bottled about 150 years ago at the Glenavon Distillery in Banffshire and was bought for £14,850.